Zoom imageFetlar shop. The shop on Fetlar is now open ! Following a change of ownership and a refurbishment the shop has now reopened. Provisionally the shop will be open 10am to 4.30pm, 7 days a week. Any changes will be posted here. The Post Office is located in the shop premises, minimum opening hours are 11am - 1pm on Tuesday, Wednesday, Friday and Saturday. However subject to availability of trained staff it may be available outside these times, but that cannot be guaranteed. The shop currently has a limited range of stock, but this will be increased over coming days. More details and photos to follow. The nearby islands of Unst and Yell offer more shopping options. 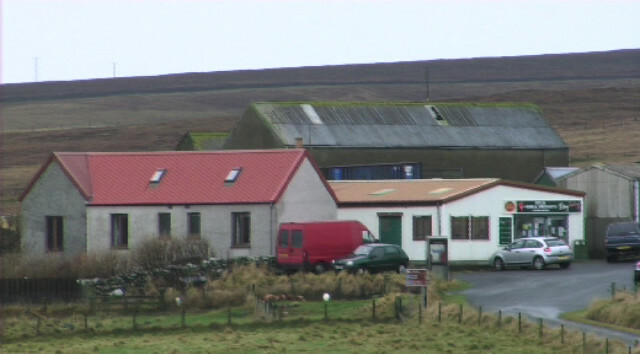 Unst has three shops: The Final Checkout, Skibhoul Stores and H.Henderson. The first two both offer fuel, and Skibhoul also have their own bakery. Yell has five shops: RS Henderson in Cullivoe, Linkshouse Stores in Midyell, The Aywick shop, Burravoe Community Co-op and The Ulsta Shop. Further afield there are two supermarkets in Lerwick: Tesco and the Co-op. Lerwick also offers a wide range of other shopping opportunities through various local outlets, including Boots the chemist and an M&Co clothing store. Currently there are options for getting deliveries from shops delivered into the island. One example of this is RS Henderson based on Yell which delivers every Friday. There are bus services available which can allow those without there own transport access to shops off island.